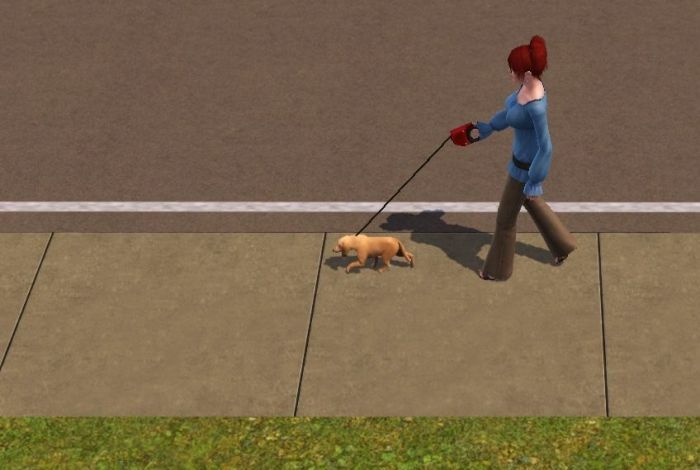 The Grim Reaper Stole My Dog #Sims3 – Nomadic Gamers, eh! I’m a fan of games like EVE Online, Guild Wars (and Guild Wars 2) and even World of Warcraft – but some times I just like to relax and play by myself without having to deal with anyone. For this, I have been a long time fan of the Sims franchise. Sims 3 is a LOT of fun, there’s so much to do, build, and see. I own quite a few of the expansions they put out but there are so many now that it’s hard to keep up, especially on top of any MMO I may be playing. Still, since I reformatted my PC I had a clean slate, and reinstalled my Sims 3 game, dedicating a few hours to it last night. The last expansion I picked up was the Pets one, and I hadn’t gotten very far with it. I spent my Sim day in a typical fashion. Became a self employed writer, rummaged through some garbage cans in the neighbourhood (even found an uncommon seed), and tried to get one of the (many) wild horses roaming around to befriend me. Most of them shied away. Eventually I decided I should adopt a dog, and I picked out a great one. ‘Stone’ was his name, and he was a genius. Except two minutes after our introduction the grim reaper paid me a visit and killed my dog! I didn’t even have time to purchase a dog bowl or bed for Stone before he was an urn on my living room floor. GAH. I gave my sim the appropriate 2 days to mourn, placing Stone’s grave outside in the yard. It’s a cute little dog bone. That night I was visited by ghost Stone, who fell asleep at the end of my bed. A bit creepy, but that’s alright. Once the two days had passed I adopted a second dog, this one named ‘Taylor’. Hopefully she lasts a bit longer. At least I had time to take her for a walk (pictured above). I bet it would make a great country song. I played Sims 3 Pets a lot and had this huge collection of all the different kinds of reptiles and small pets in their cages. That was fun. I haven’t played in a while, but apparently the next expansion has werewolves, so I’m going to have to look into that. I just can’t do Sims games later than the original Sims. They seem so less sand-boxy from the impression I get when looking at the Mrs playing.